Jofu Falls (常布の滝) is one of 100 best waterfalls in Japan. It is located in Kusatsu, Gunma Prefecture. The waterfalls is about 40m high and very unique with red rocks surrounded. 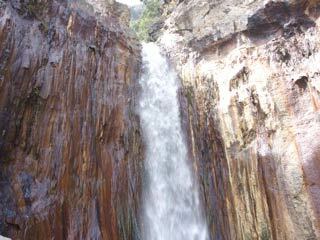 It was used to called secret waterfalls because it was located deep side of Mt. Shirane. Observatory is not so hard to reach, but the bottom of the waterfalls requires high skill of climbing. 1. use bus to Tenguyama Gerende. Jofu Falls is one of the hardest waterfalls to see in Kanto Region because it is located in the deep side of Mt. Shirane. You need a car to travel easily. Use 292 to Tenguyama 6th parking, walk forest street (40 min.) to Observatory, walk mountain pass (40 min.) to the bottom of the falls. You don't get lost because there is many signs on the pass but it requires hard walk on the cliff side. Be very ready for it. It the weather is not good, please don't try to visit there. Also, there is a bar, too.